“Driven By Destiny” Book Release Party with Me & Tasha Smith from Tyler Perry’s “Why Did I Get Married?” It was an awesome event on 10-10-10 with LaRetta Taylor and Laureen Parks. Dear LaVerne, I want to thank you for being a very caring person. We haven't known each other long but I can already thank you for changing my life. I must say that was amazing. You have a way of getting all up in a person's world (in a good way). LOL. You are such a blessing! So again LaVerne, I appreciate you. Thank you. Wonderful affair! I enjoyed myself tremendously and was truly blessed. I have not stopped sharing. Please keep me on the list for the next one! I want to thank you so much for allowing me and my husband the experience we had last night at the destiny celebration as I sat there with tears rolling down my face. It opened up my thinking and now I have to do what I always felt I wanted to do… you can’t imagine how many people you have touched and are going to touch. Everyone I spoke to today knew what I did last night 🙂 God has allowed you in my life and I thank Him for this. The ladies group will be attending in the future:) I hope we can be the venue you come to in June for our annual celebration we’ll talk about that later too. I just wanted to let you know You are a Godsend! I just have to take the time to let you know what an awesome time I had at your event “Your Date With Destiny” it was a life changing event for me. The atmosphere was filled with nothing but positivity and the event itself from the reception to the program and dinner was outstanding. I believe you have to be bold and powerful when it comes to your destiny. Dr. LaVerne Adams & Tasha Smith proved that and shared their own intimate, personal experiences. If it meant helping others they took center stage and gave it their all. Each woman shared from her truth and gave you their path of pain that lead to their destiny breakthrough. Their testimonies were raw and real which brought the audience to their feet! People who attended were able to name where they were stuck and unable to move forward. This allowed many in the room to reclaim their own purpose and be begin again with a renewed sense that they can do it! If you ever doubted that you had the power before you entered the room, you certainly didn’t by the time it was over. It was an amazing life-changing experience. This is what happens when you are called and anointed to do something versus, this is just my job and I do it because it pays the bills. The ‘Your Date With Destiny’ event was an awesome event that truly needs to be duplicated across various states. The candid conversation with Dr. Adams and Actress Tasha Smith, was very open, honest, real and very encouraging. So many times we are not willing or ready to share the bad or disappointing situations in our lives, but it is these experiences that God helps to move us forward and put us in the position to help others. It was not just for entertainment purposes but an eye opening experience. I am truly looking forward to reading my copy of the Destiny book. Don’t delay and get yours today! As the evening came to an end and I walked slowly to my car, the night air, warm and breezy, held the spirit of the essence of the evening. I overheard people from the event talking, sharing their emotional experience, vowing to move forward toward their life’s destiny. Just in case you did not make it, no worries, Dr. LaVerne, promises this is just the beginning….so stay tuned for more monthly Your Date With Destiny events…and like life, it’s something you don’t want to miss! As an Elite VIP Member, you get total access to all of the tools that you need to dynamically transform your life. Please call me so that I may create a personalized transformational program specifically designed just for you! I have been recognized by major media and executive leaders as a transformational professional with 25 years experience as a spiritual leader. I have been an advisor to great people and am passionate about serving high profile professionals just like you with my proven strategies to find more meaning, satisfaction and fulfillment in life. This is your time to transform and experience what it truly means to be alive! Total Life Transformation, LLC is the only firm that serves high profile professionals with the CUPID strategic life map that is fully Customized to match their Unique Personality and Individual lifestyle and is Designed to help them effortlessly perform at higher levels while finding more meaning, satisfaction and fulfillment in in life. 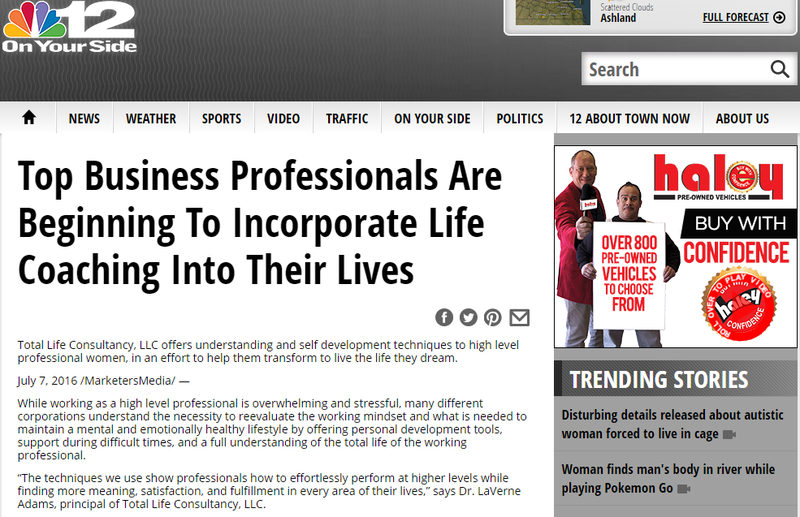 Dr. LaVerne Adams has been recognized by major media for 25 years of transformative results.